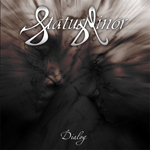 Strengthening their progressive metal roster, Lion Music presents Finland's Status Minor and their debut work Dialog. Status Minor's aggressive progressive power metal is a perfect compliment to stable mates Seventh Key and Mind's Eye. The music of Dialog features some outstanding vocal arrangements and tag team guitar and keyboard solos over sometimes heavier arrangements akin to Evergrey but without the harshness. Now none of this is terribly new in Scandinavian progressive metal, yet Status Minor handles it very well. With that last thought in mind, the first to tracks of Dialog, Something More and Out of These Streets, are basically generic progressive power metal. If you only listened to these two, you'd probably be disappointed and wouldn't continue. But immediately follows is refreshing as Status Minor pushes Markku Kuikka's vocals to forefront over some bright piano work on Stand and Think and Masquerade. A certain predictability follows Fade Away, but Status Minor gathers themselves for the more complex and keyboard-laden Machine. Yet the real magnum opus is the title track, Dialog. True fans of progressive metal will be convinced of Status Minor's skill at combining moments of subtlety, heaviness, and complexity without resorting to redundancy. Dialog is easily the finest track on the album. On Dialog, promising metal newcomers Status Minor balance generic progressive metal with their own innovation for a significant debut. Songs like Stand and Think and epic title track should catapult Status Minor above their peers. Recommended! On Dialog, promising metal newcomers Status Minor balance generic progressive metal with their own innovation for a significant debut. Songs like Stand and Think and epic title track should catapult Status Minor above their peers.